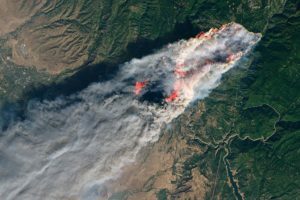 The Camp Fire in California as seen from the Landsat 8 satellite on November 8, 2018. Pacific Gas and Electric Corp has filed for bankruptcy, a legal proceeding that could deny forest fire victims compensation. “California’s largest utility, facing up to $30 billion in potential liability for recent California wildfires, filed for Chapter 11 bankruptcy protection,” CBS News reports. “Filing for bankruptcy essentially ensures the company can continue to operate and its customers will get power, but doesn’t assure any of the fire victims will get compensation — or that ratepayers won’t get hit with part of the bill, CBS San Francisco and CBS Los Angeles say,” the report notes. “The filing enables PG&E to freeze its debts and continue operations while developing a financial reorganization plan,” CBS News reports. PG&E aims to secure $5.5 billion in loans during the bankruptcy.